What does a blue reflector (cat's eye) on the road mean? What does a blue reflector (cat's eye) placed on the road mean? 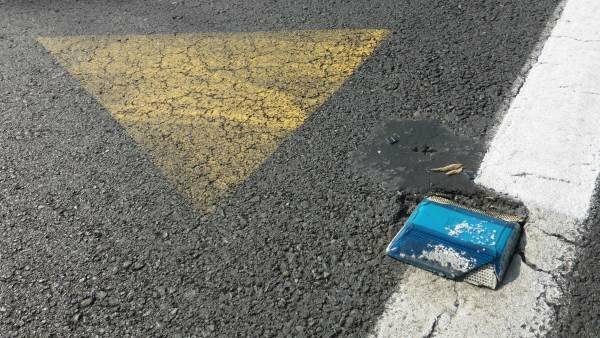 What does a blue reflector (cat's eye) placed on the road mean? Correct. There is a fire hydrant nearby, so be careful where you park. These blue reflectors are installed on, or just to the left of the centreline of the roadway. They were first introduced in 2004. They are called retroreflective raised pavement markers or RRPMs. In other countries they are called road studs. The blue reflector shown above is right next to a yellow triangle which points to the fire hydrant. While you might not notice them while you are driving around, they are useful for vehicles attending a fire because they can quickly locate a source of water. Read more about fire hydrants here.